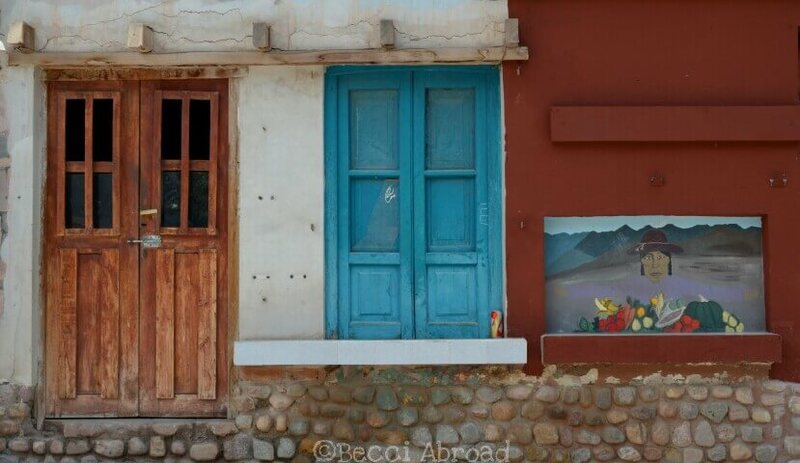 A trip through Argentina’s Northwest province of Jujuy will take you through landscapes of multicolored mountains, giant cactus, salt lakes and low-build colored houses. Jump on for a trip through the Northwestern part of Argentina, and get inspiration for your own itinerary! During a week in January, I joined my mum and her husband on their road trip around the Northwest of Argentina to explore some of these often forgotten corners of Argentina. 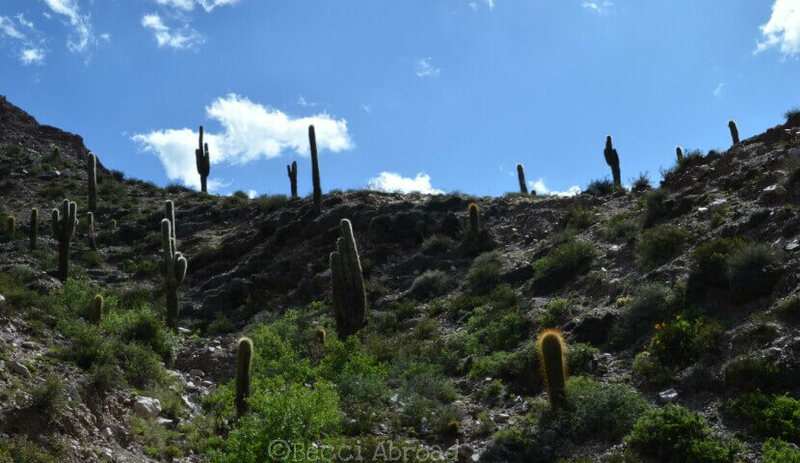 Here I share some of our experiences after traveling to Jujuy, Purmamarca, Tilcara, Uquía, and Humahuaca. Hopefully, it can help you plan your own trip around the region, or inspire you to visit. 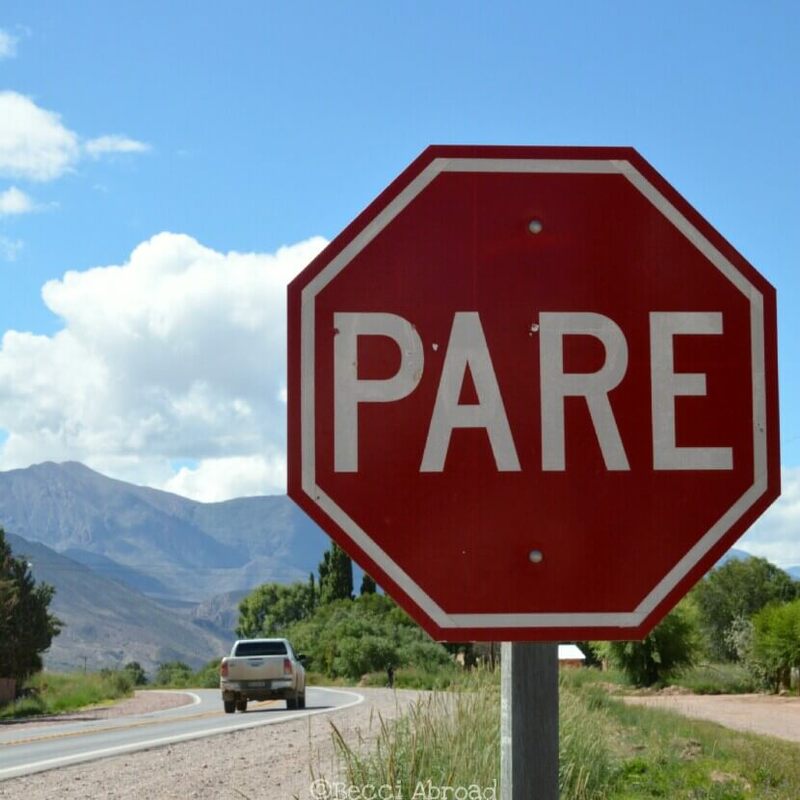 Traveling through the Northwestern part of Argentina made me understand even clearer how different and diverse Argentina is. People would smile at me when I felt the need to clarify that I was not just a foreigner traveling through but I actually live in “Capital” (e.g. Buenos Aires). The responses were usually friendly and humble; “El interior es muy mejor” (e.g. the interior provinces of Argentina is better). The regions in Argentina are really worlds apart, and up here in the far corner of Argentina life goes at a completely other speed than the cosmopolitan vibes of Buenos Aires that I’m used to. We started out in Salta. More precisely, Salta Airport. I arrived from Buenos Aires by plane. Beforehand, my mum and stepfather had rented a car by Hertz. Even though it is possible to get around in the region with other kinds of transportation, a car just gives you so much more flexibility. Directly from the Airport in Salta, we headed towards Jujuy. 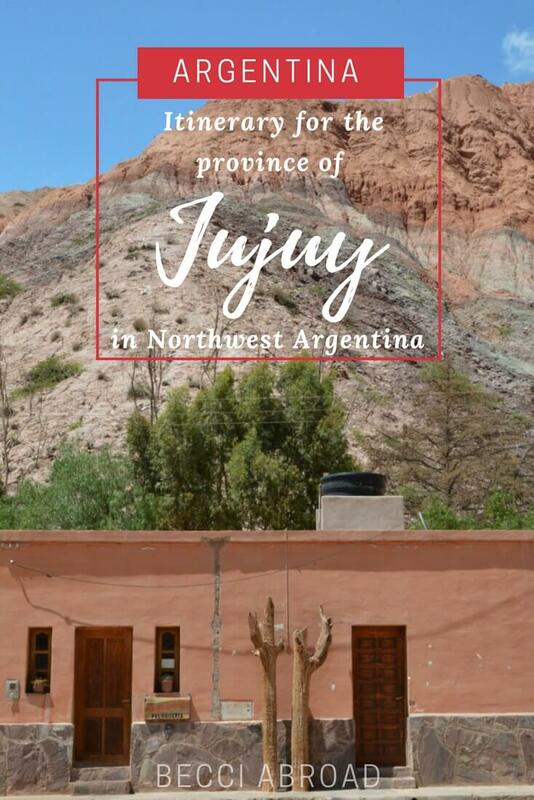 I don’t know why but Jujuy has always drawn my attention. Maybe because of its strange sounding name or because I still recall my university teacher of my Argentine history course talk about how Jujuy is so politically and economically different from the rest of Argentina (okay, a nerdy historic explanation is needed here but I will save that for another time). 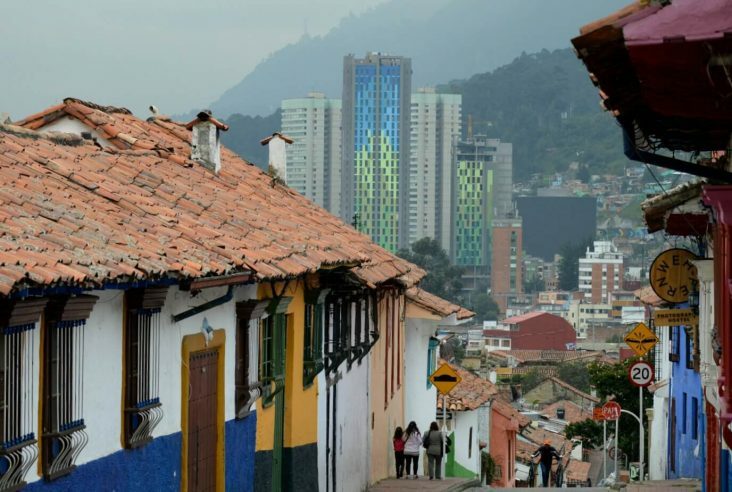 Nevertheless, the city of Jujuy, or San Salvador de Jujuy as it is correctly named, which is the capital of the Jujuy province, was an uninspiring provincial town with a slow goofy mood. I was not impressed. Maybe even a bit disappointed… My teacher must have meant the Jujuy Province as a whole, I reasoned. The day after we headed further North to Purmamarca. 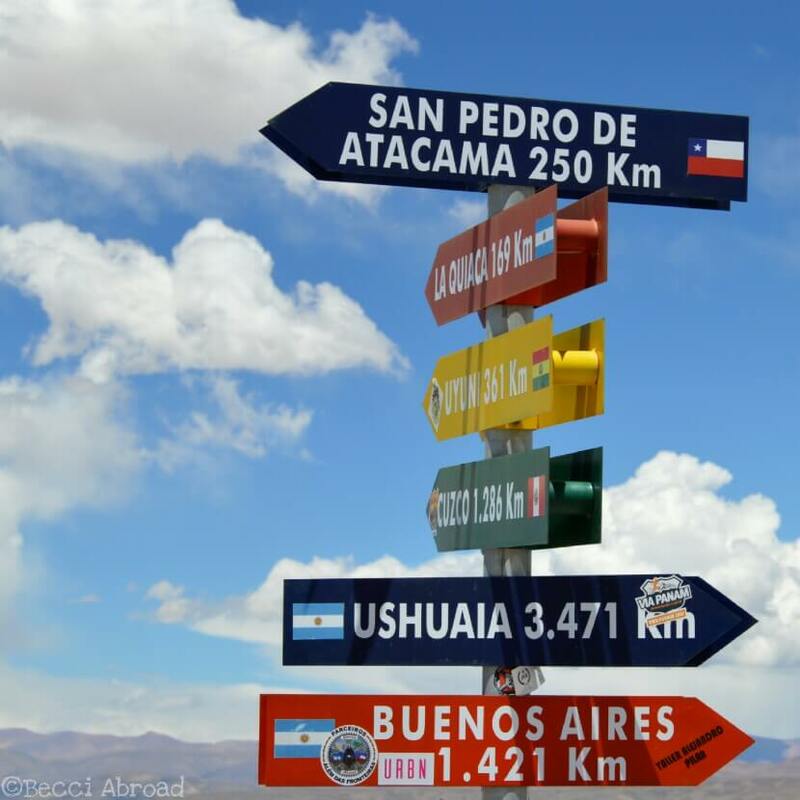 What to do in San Salvador de Jujuy? 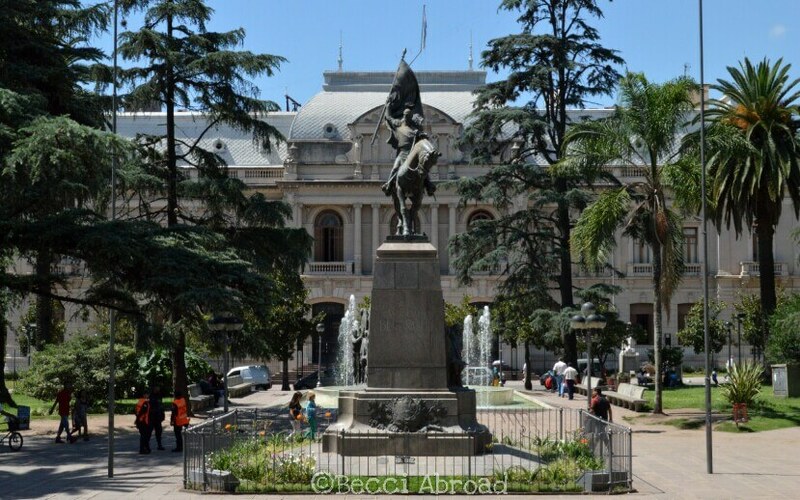 The main square in Jujuy is called Plaza Belgrano and is located between the street Grl. Belgrano and Independencia. In the middle of the park, you have the huge mansion which is the Government House of Jujuy. Beautiful to look at, and take some photos. On the corner of the street Grl. Belgrano and right next to the actual Cathedral of Jujuy, there is a huge gate leading to a Spanish-style patio. That is the museum of the cathedral of Jujuy. For a couple of pesos, you can get inside the patio where a statue of General Belgrano stands looking proud with the Argentine flag in his hands. 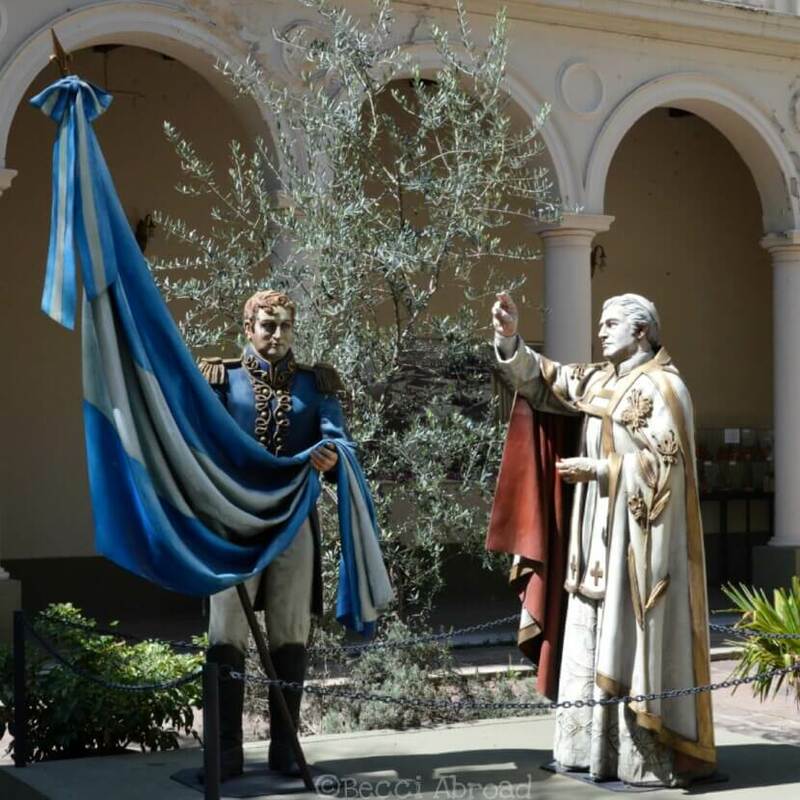 The legend says that after winning the battle against the Spanish in Tucumán, General Belgrano should have taken the first Argentine flag to the Cathedral of Jujuy to receive God’s blessing of the flag. Now you can see the statue of the very same act. 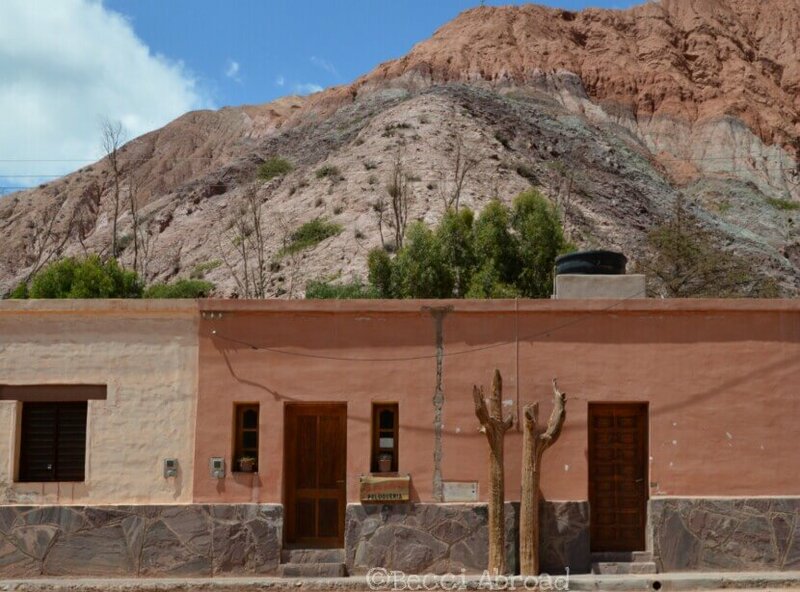 Purmamarca is located between multicolored mountains approximately 65 km North of the city of Jujuy (or, a little more than an hour’s drive). The scenery up here is completely different from that of Jujuy. 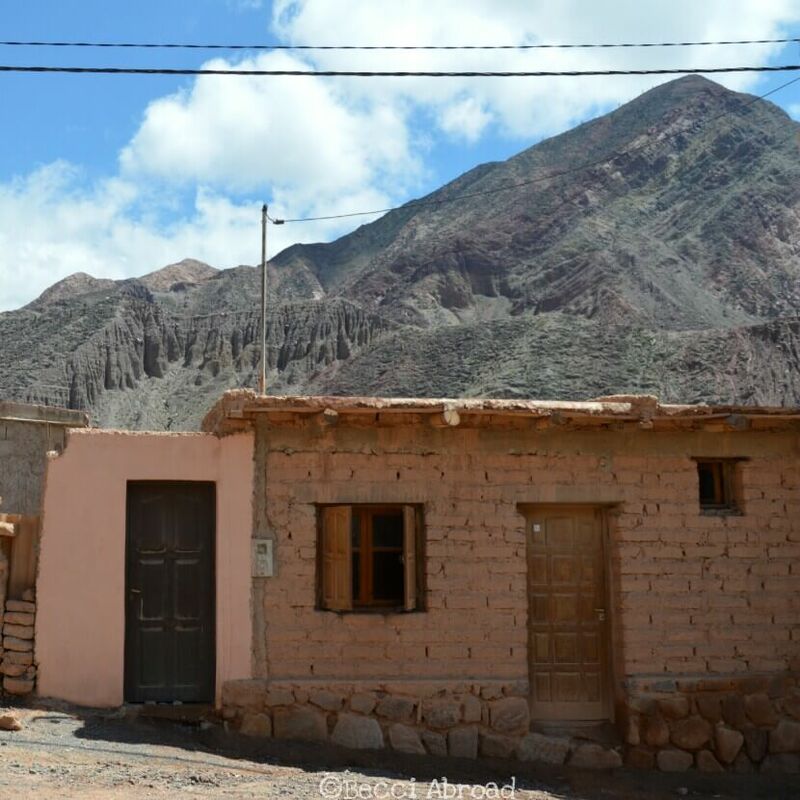 The village of Purmamarca consists of low-constructed houses and towering stone-mountains, whereas those around Jujuy were lower and dotted with green trees. 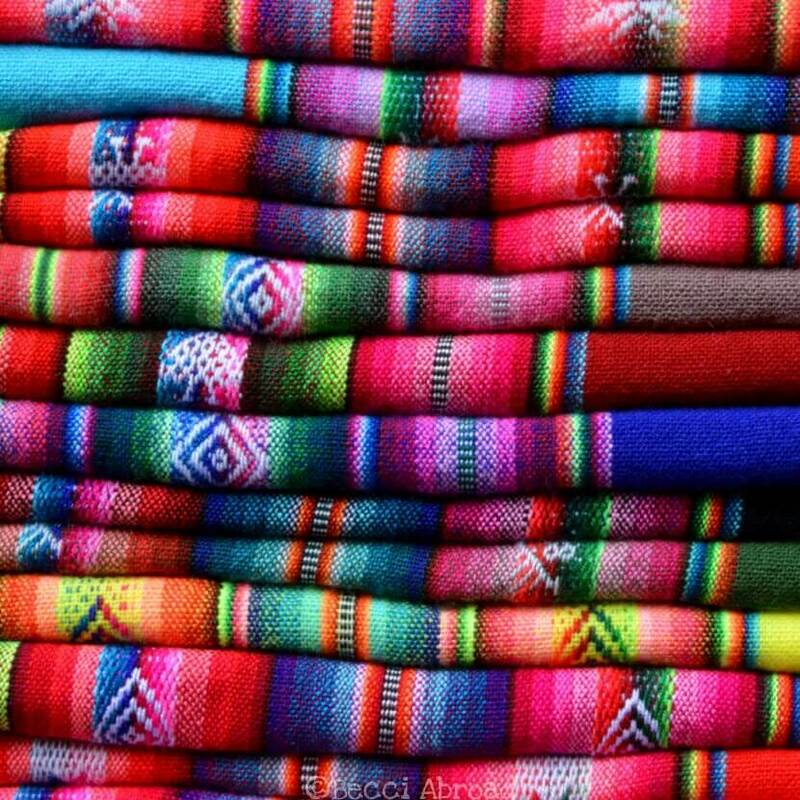 Purmamarca is almost exclusively (okay, let’s rather say; exclusively) famous for Cerro de los Siete Colores or translated “Mountain of Seven Colors”. A mountain formation which is said to have seven different tones of colors in it. However, actually, it depends on how the sun lights on the mountain how many colors you can identify. Let me be completely honest with you; it took me awhile to realize which mountain was the “famous” seven colors one. Most of the mountains around Purmamarca is astonishing and colorful in their own way. Purmamarca is a small village which primary economic income comes from tourism. One quickly notices that as there are many souvenir shops, touristic-looking restaurants and different types and styles of options for lodging. However, there are also some different activities to do. 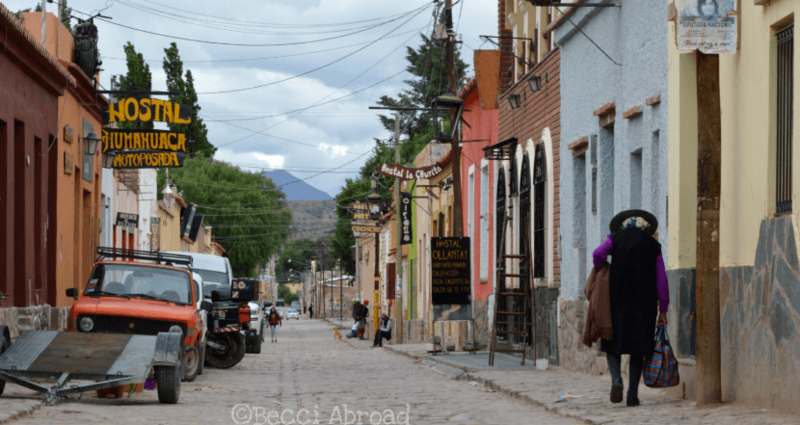 Read more about what to do in Purmamarca here. 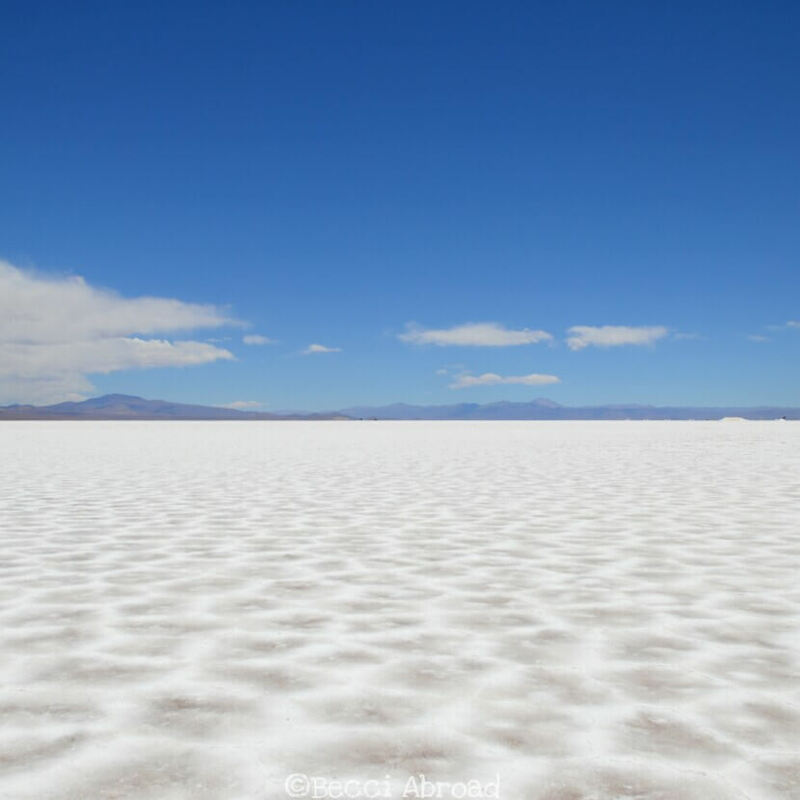 The village of Purmamarca was a bit too touristic for my taste, but it is an ideal place for visits one of the biggest attractions in the region: the Salinas Grandes salt flats. Salina Grandes is a massive area of salt flats in style with the Salar de Uyuni in Bolivia (though, a lot smaller than the ones in Bolivia). 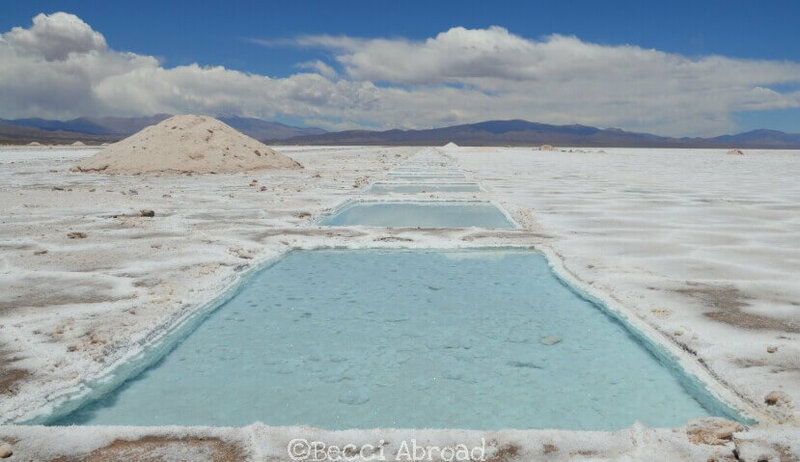 The Salinas Grandes is used to the production of salt, thus a tiny bit of it has been open to the increasing tourism in the area. A group of indigenous l turns tours on the salt flats from the parking lot by the edge of the salt flats. The tour costs behind 200 and 300 pesos (in the moment of writing) and takes around 40 minutes to an hour. You can read more about them here. 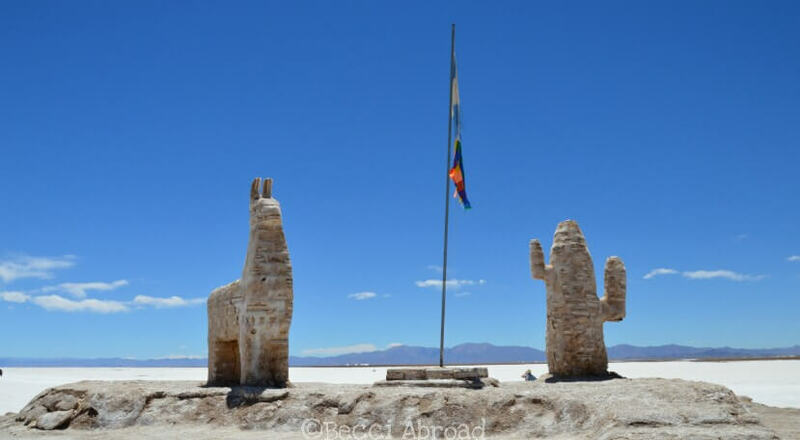 You can arrive at the Salinas Grandes by following the Ruta Regional 52 from Purmamarca for around 1 – 1,5 hour through crazy mountain roads with cactus-dotted mountains on each side. On your way, you will pass different landmarks such as a milestone for being at 4,170 masl. And llamas… If you are lucky! I have a huge fascination with llamas. Properly mainly because they are very exotic animals for me, and had this idea that there would be llamas all over in the mountains of the Northwest of Argentina… I was wrong! 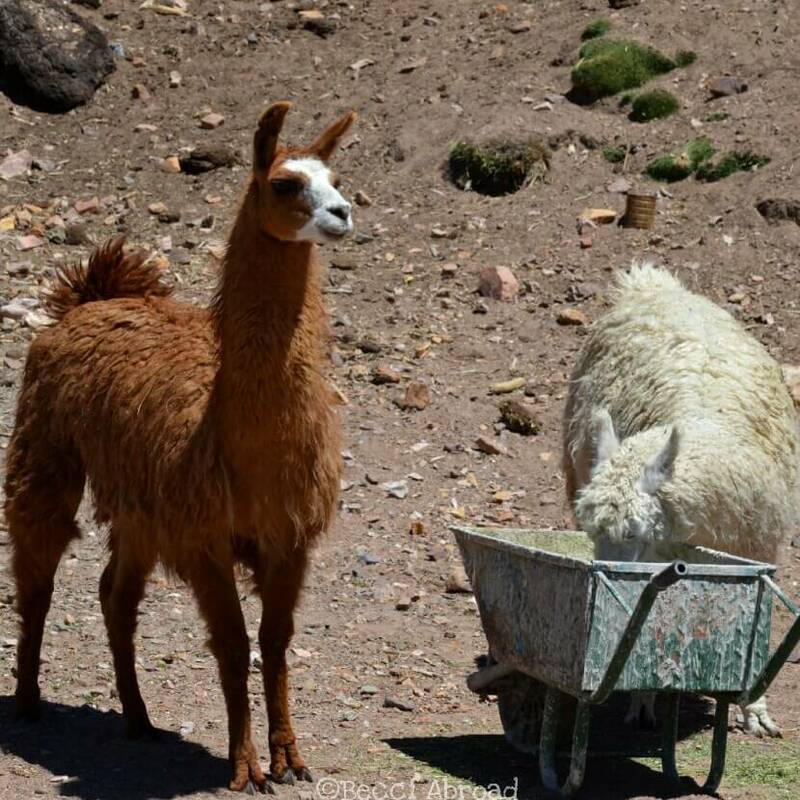 We saw one larger flock of llamas on our way to Salinas Grandes but they seem to belong to the man working the kiosk by the side of the road. After two nights in Purmamarca, we headed further North and made a quick stopover in Tilcara. 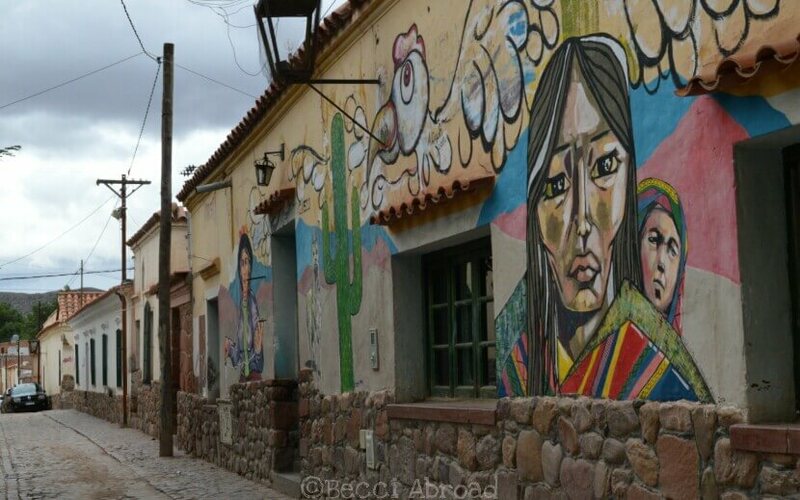 Tilcara is located around half-an-hours drive north from Purmamarca on Ruta Nacional 9, and has a similar vibe to it of an economy heavily based on tourism – just in a larger scale than Purmamarca (needless to say more, right?). 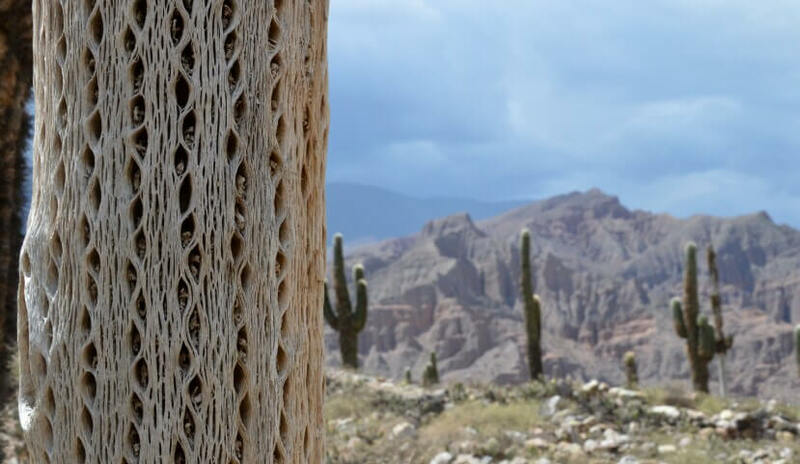 The Pucará de Tilcara is an area which is believed to have been of high importance for the indigenous civilizations of the region in ancient times. The Pucará has been reconstructed as it was believed to have been by then. Thus, it must be highlighted that the Pucará is not ruins from the Incas, in style with Machu Picchu in Peru instead it is a reconstruction. 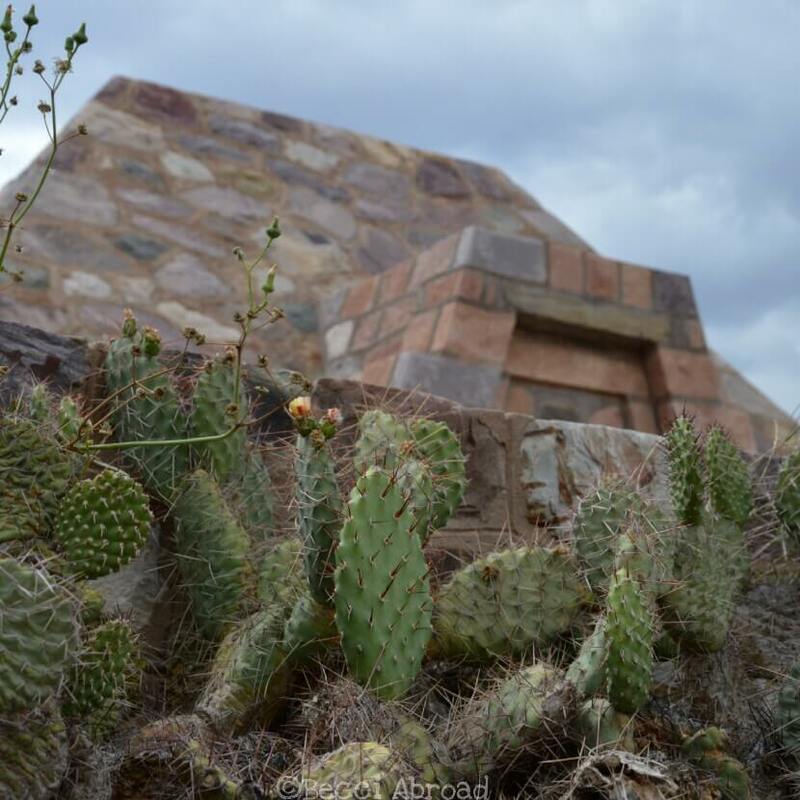 Nevertheless, for me the real attraction for the views of the mountains and the cactus! Read more about visiting Pucará de Tilcara and the nearby Devil’s Throat here. One thing that I completely regret not having researched properly before heading to the Argentine North was the possibility of “meeting” llamas (properly based on my misconception that they would be everywhere). 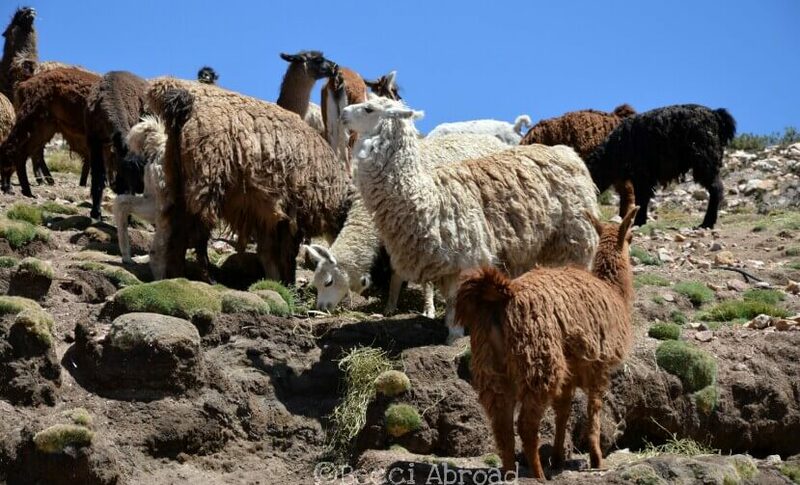 In Tilcara, you have the possibility to book a tour to trek with llamas (either half-a-day, a full day or several days)! I can’t recommend it as I didn’t try it buuut I would definitely go back to get a chance to try it! 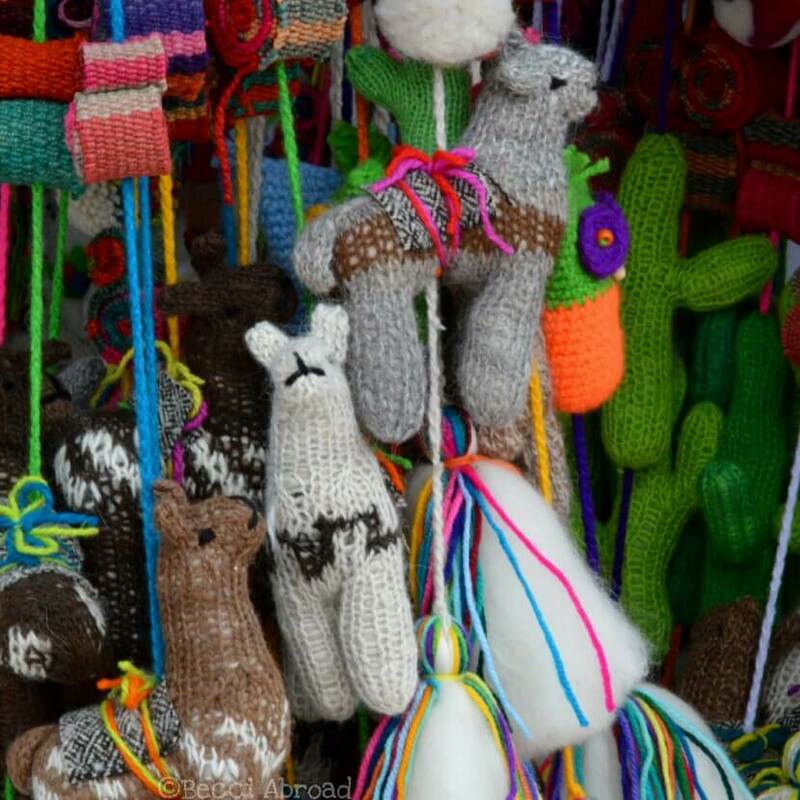 Check their website here; Caravana de Llamas. 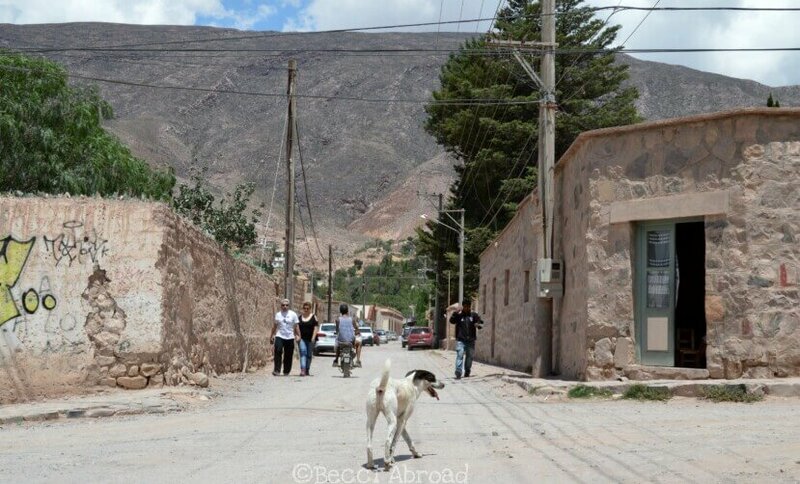 Uquía is a super tiny village located between Tilcara and Humahuaca on the Ruta National 9. The village is far from touristic, even though, the main “attraction” is the small church with Saints wearing weapons. Both Tilcara to the South and Humahuaca to the North is easily reached by car from Uquía. 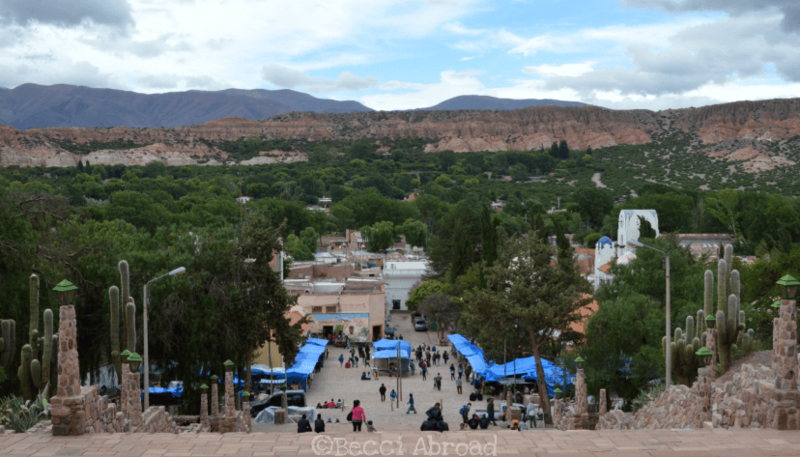 We spent the next two nights in Uquía visiting Humahuaca and Cerro de Catorce Colores. Depending on your likes, the nights can also be spent in either Tilcara or Humahuaca. 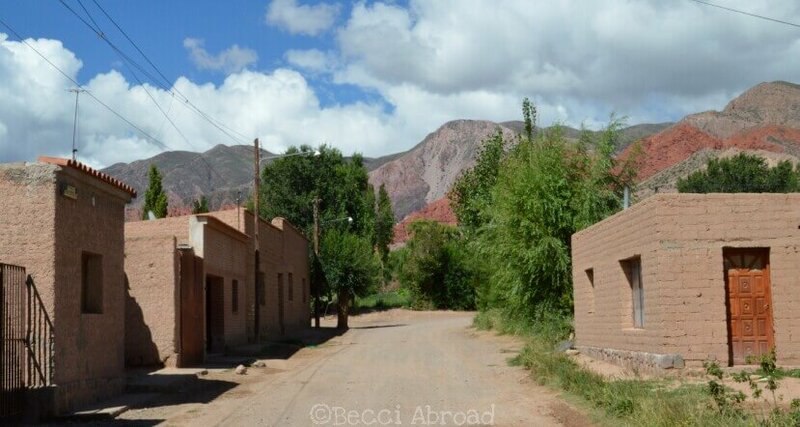 Humahuaca is located another hour further North from Purmamarca (around 40 minutes from Tilcara) on Ruta Nacional 9. 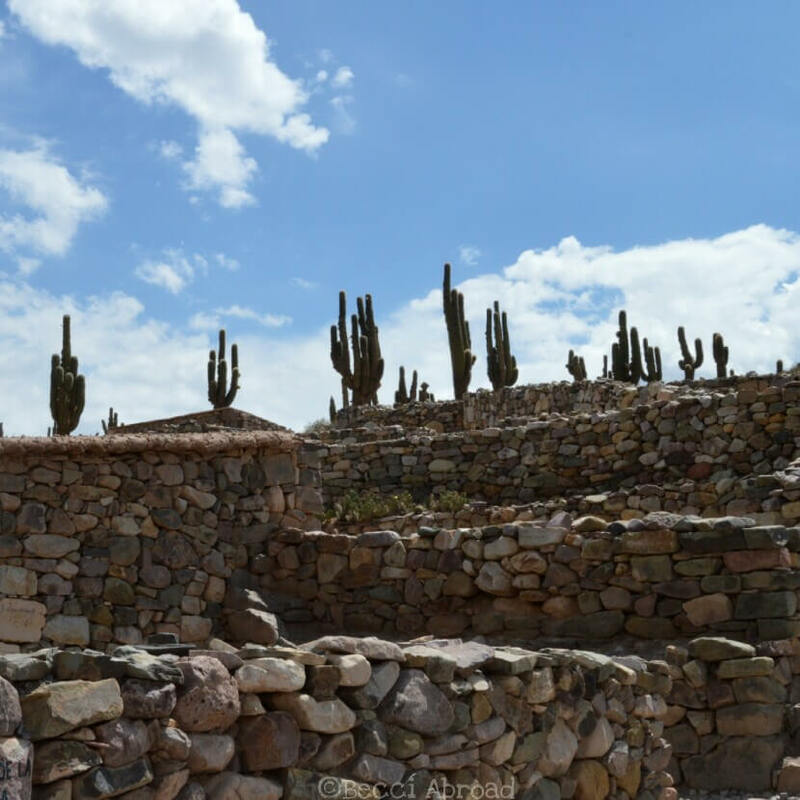 Even though the construction of the village is very similar to that of both above-mentioned, the feel of Humahuaca was a bit more authentic. A feeling of actually being in a town where there were other people living than tourist just stopping by for a couple of days. 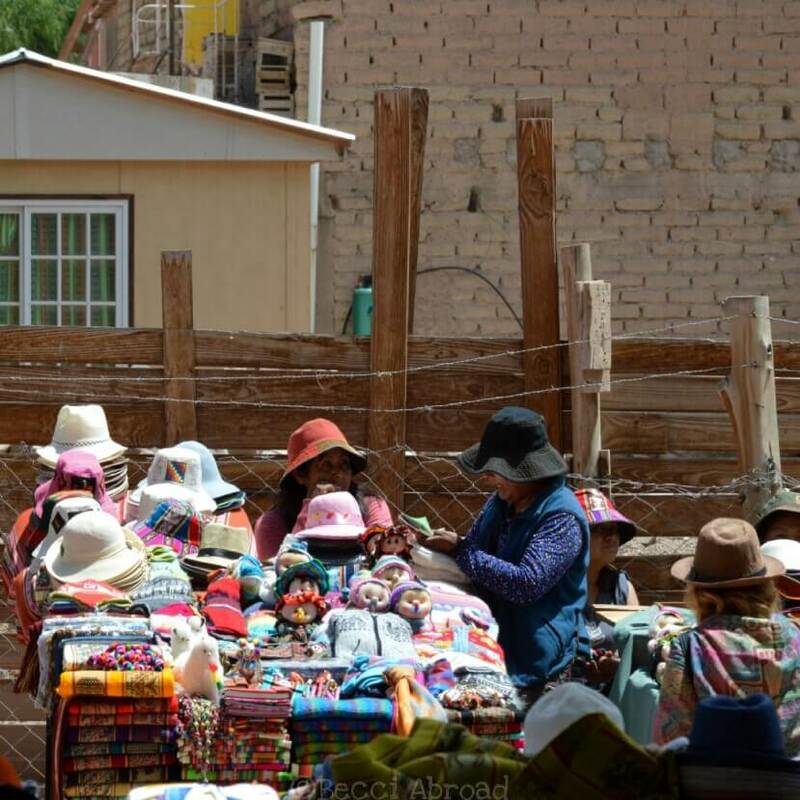 There are, of course, small shops selling all kind of souvenirs, the classic textiles from the region and sweater, but I just liked the bustle of people going on with the everyday life in Humahuaca. 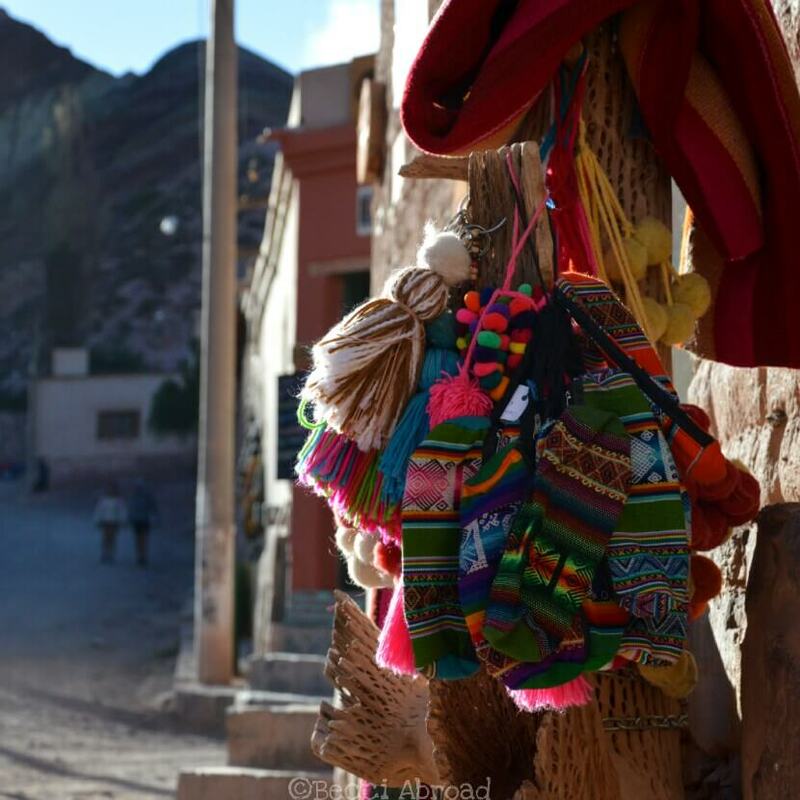 The properly most popular activity when around Humahuaca is to visit Cerro de los 14 Colores or “the mountain of 14 colors”. 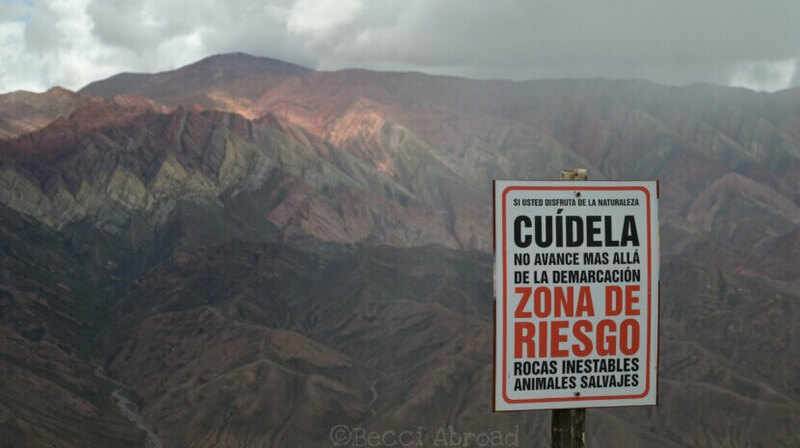 These colored mountains are located around 20 km outside Humahuaca through crazy mountain roads. Even though the drive is tough (happy I didn’t have to drive it!) the views are amazing, and completely worth it. Read more about the fourteen colored mountains of Humahuaca here. 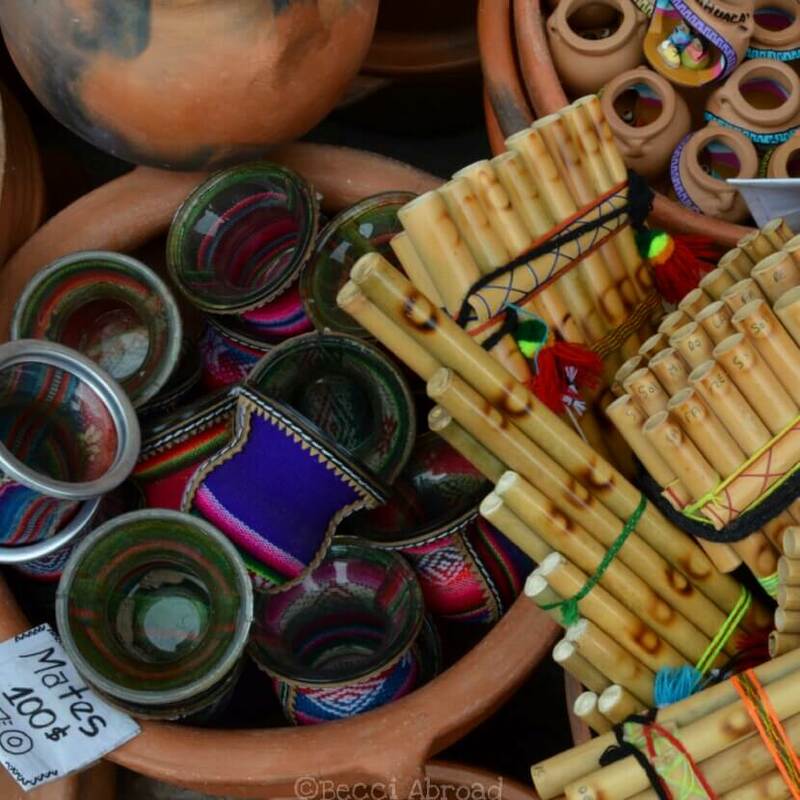 What to do in Humahuaca? 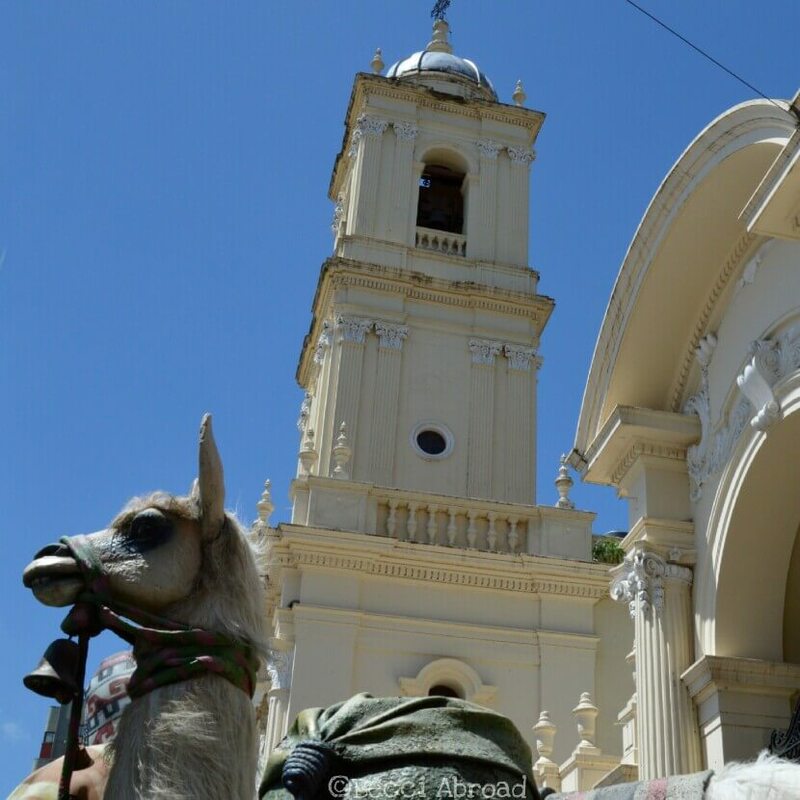 By the town square is the old town hall, el Cabildo, and the cathedral Nuestra Señora de la Candelaria. The town hall should apparently have a watch with a real size statue of the benefactor of Humahuaca, San Francisco Solano, that appears and do some slow movements with his hands to give a blessing to the village – however, missed him in action! 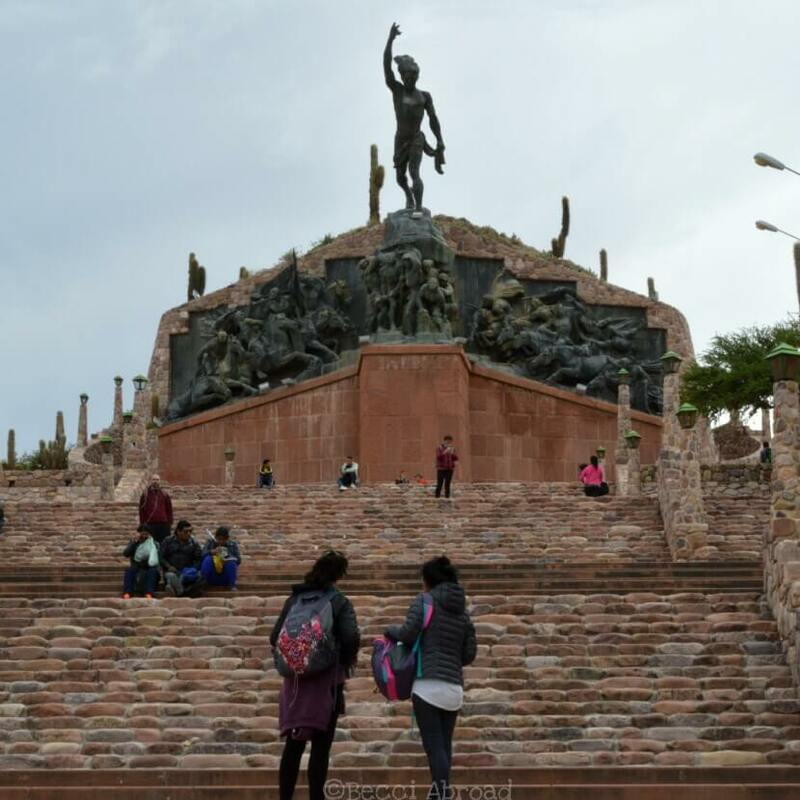 Just by the end of the town square, you have the first steps for climbing the monument for the heroes of the independence war.A massive and strange-looking monument in stone and metal… I don’t know what else to say but the views over the city are great! 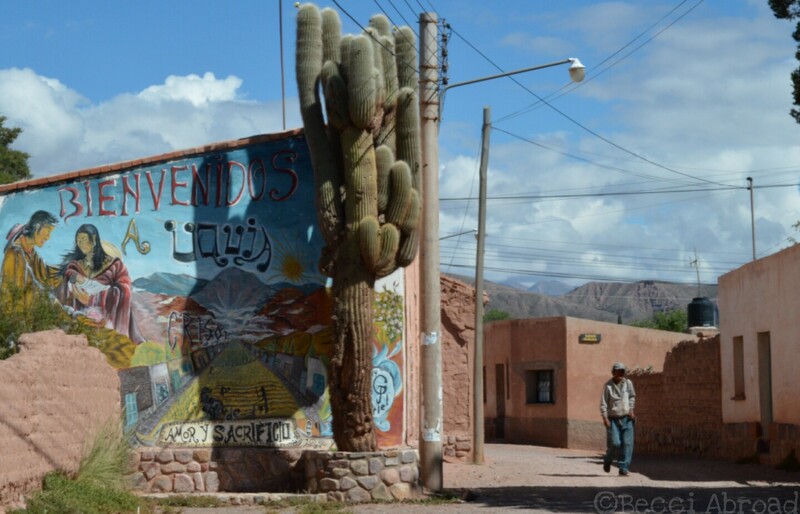 After a last night’s sleep in Uquía, we headed back towards Salta. 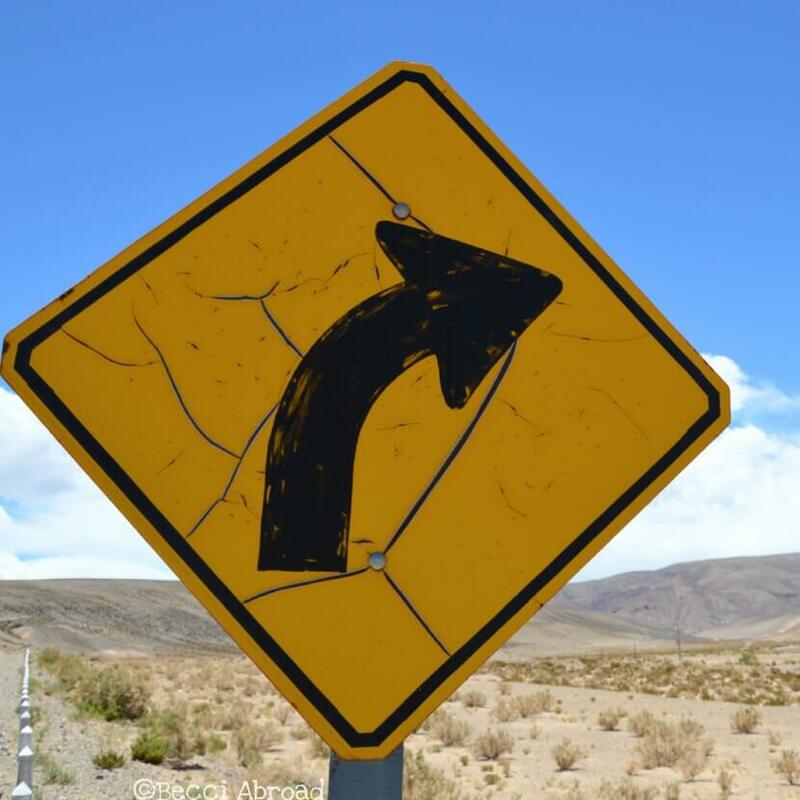 It is also possible to continue further North and enter Bolivia. In Salta, we visited the cable cars (or telefericó as it is called in Spanish) before I was dropped off at the airport to head back to the craziness of Buenos Aires. 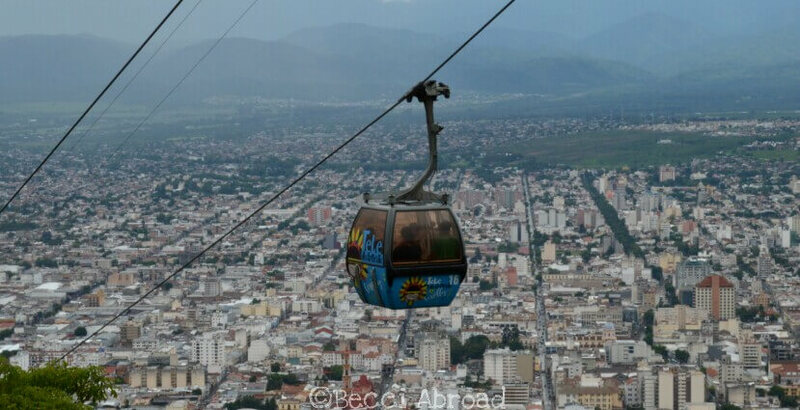 The cable cars of Salta were great fun, and with a great view over the city – even though it rained! You can read more about them and check current prices here. 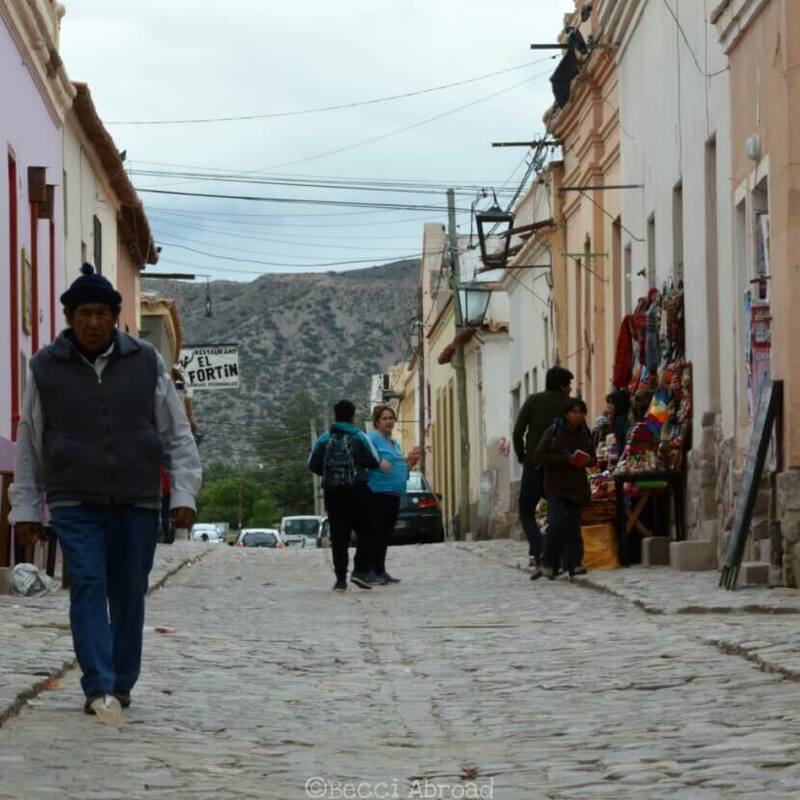 From driving through Salta, it seemed like a mini-version of Buenos Aires with huge avenues and colonial-style houses mixed with 60s buildings. 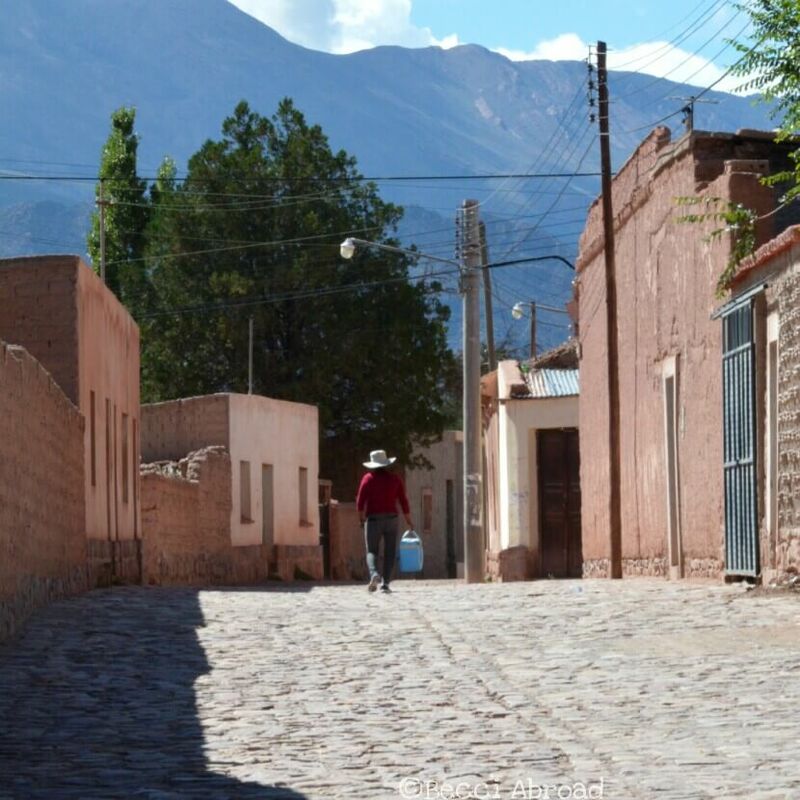 If you want to read more about what to do in Salta here. 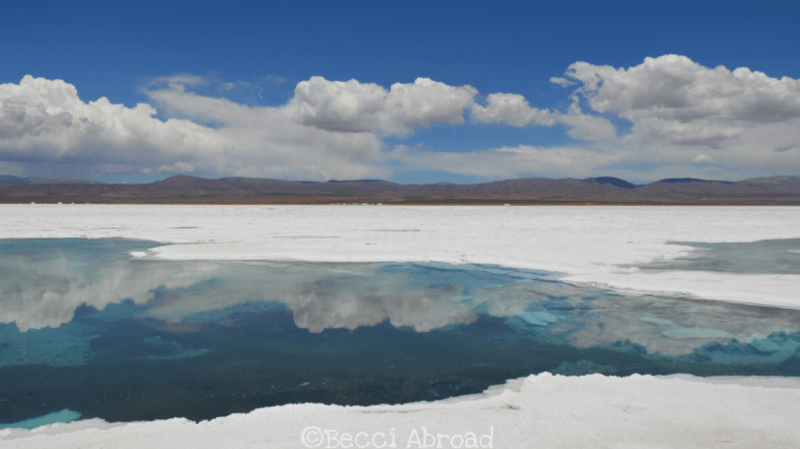 Are you planning a trip to the Northwestern parts of Argentina? Or did you maybe get inspired to visit one day? Please feel free to share your thoughts in the comments below! Enjoyed the post? Share the love, and pin me! Jeg er da solgt Rebecca, du har bestemt inspireret mig til et besøg i den nordvestlige del af Argentina. Det skal da ikke tage lang tid at pakke den kuffert 😉 Den der saltsø – og eller saltområde kunne jeg virkelig godt tænke mig at opleve. Det er bare så anderledes end så meget andet. 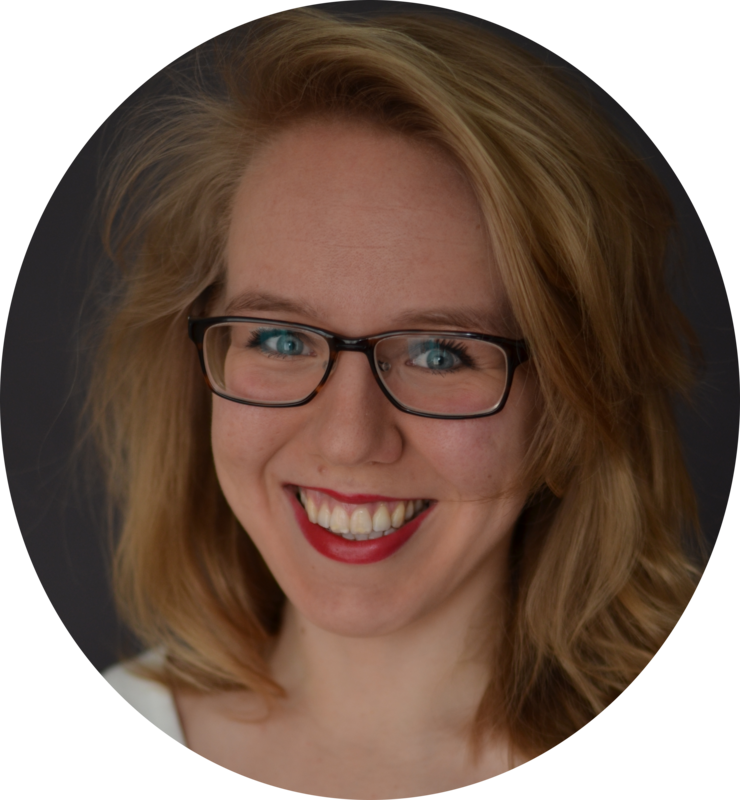 Ellers ser naturen utrolig smuk ud og de hyggelige byer får man da lyst til at slå sig ned i. Tak for endnu et dejligt indlæg med masser af smukke billeder . Awesome thorough posy that got me excited about visiting this region…especially the pictures of LLAMAS!!! Thanks for the inspiration! Thanks for dropping by, Caitlin! 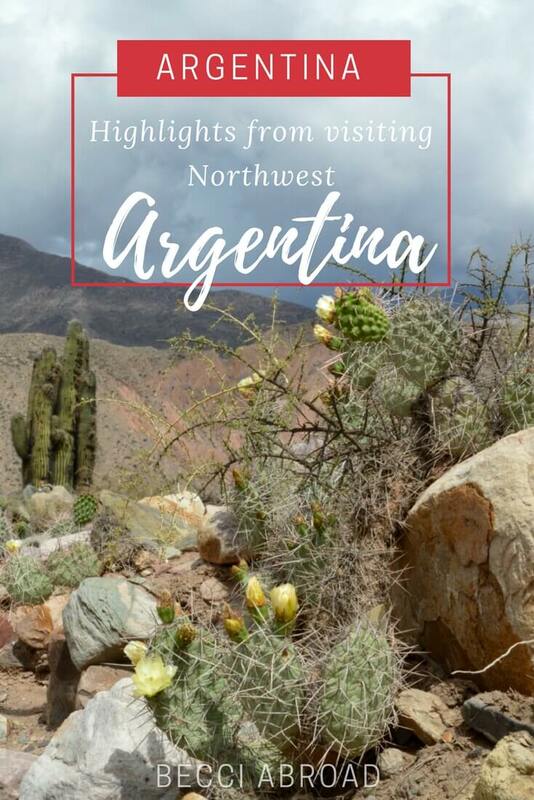 I’m so happy to hear that you felt inspired to visit the Northwest of Argentina after reading the post – that was the whole point of it 😉 Yaaah, llamas! They are so awesome! What an amazing guide and incredibly unique area! I, like you, adore llamas! So the llama trek sounds right up my alley! Amazing! The salt flats are beautiful too. Seeing those are definitely on my bucket list. Humahuaca looks amazingly adorable too. Thank you so much for dropping by, Jessica! 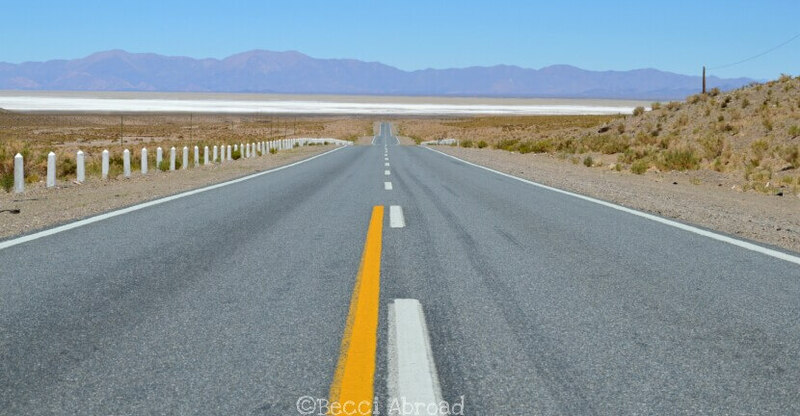 I’m so happy to hear that you liked the “trip” through Northwest Argentina. And yes, llamas are so adorable! 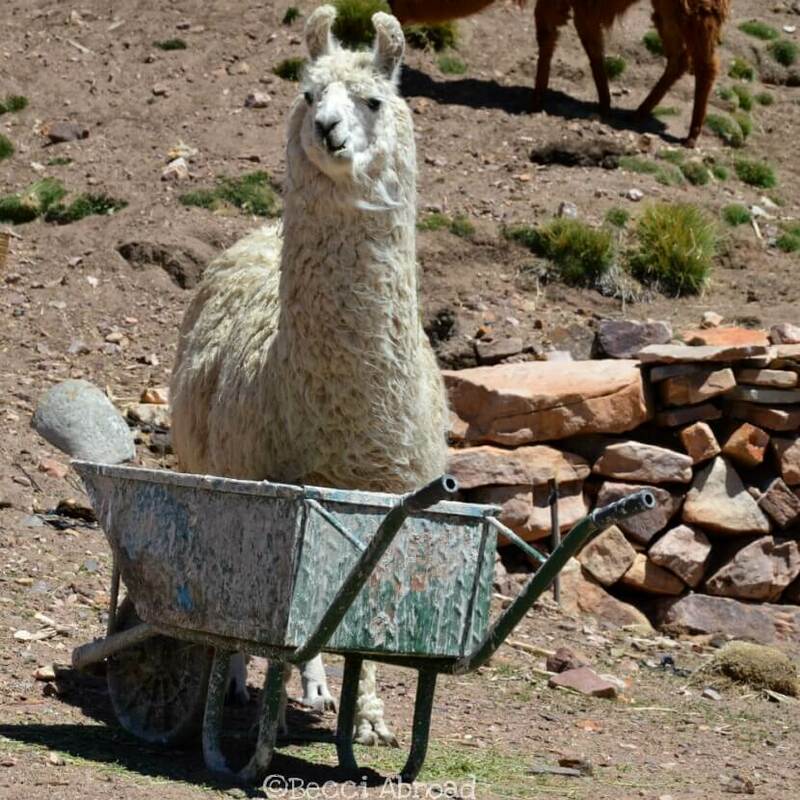 I would love to go back to do the llama trekking! Amazing guide! Your pictures capture the landscape perfectly. Beautiful! So far I just visited Buenos Aires and Iguazu in Argentina but now I would love to see more! Thanks for dropping by, Maike! Actually, the North is so different from Buenos Aires and Iguazu! Argentina is such a diverse country with so many different types of landscapes, which just makes it so fascinating to visit. What an amazing landscape! 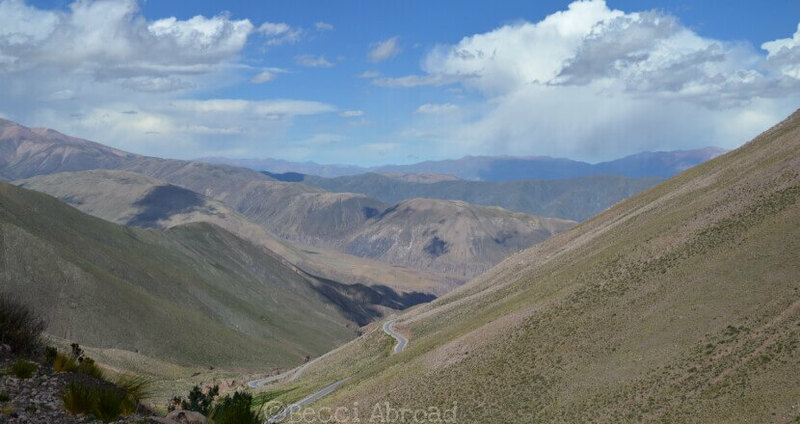 I didn’t realize Argentina had that type of landscape (shouldn’t be surprised – it’s by Peru and Bolivia). I still need to get to Argentina and I love all the different experiences available to one there. thanks for sharing the wonderful photos! Thanks for dropping by, April! 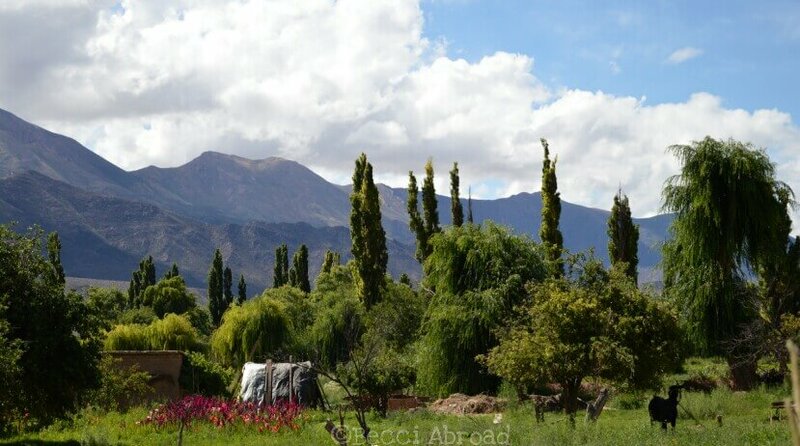 Yes, Argentina is such a diverse country with so many different landscapes in it. 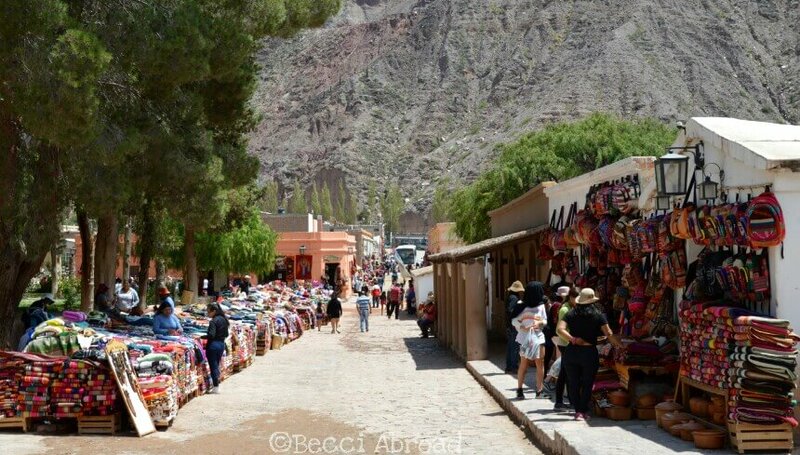 You should definitely come by Argentina one day – and hopefully the economy will be adjusted a bit by then, so it is not so expensive for foreigners to visit 😉 I’m so pleased to hear that you enjoyed the photos! 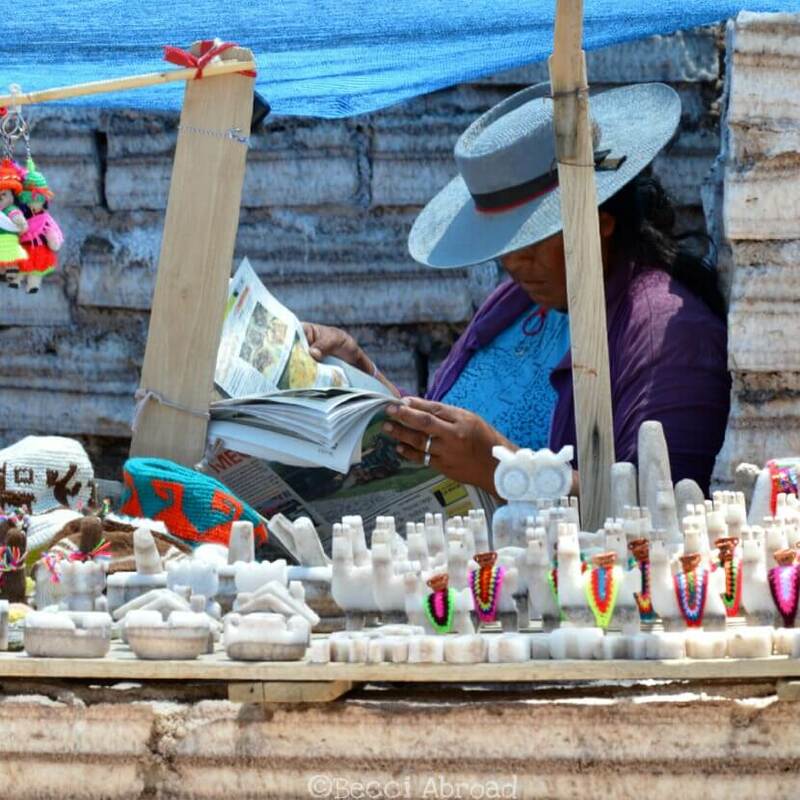 Just looking at the pictures, I’d have guessed that it’s Peru :-). Hope to be back in Argentina later this year even though it will most likely be Buenos Aires again. However, one day, I’ll make it to the northwest of Argentina, too. Thanks for sharing the beautiful photos and tips. Thanks for dropping by and for your sweet comment, Becky 🙂 Yees, they are so cute those llamas!